Salinity is a serious threat to agriculture productivity. Beneficial microbes could be simple and low-cost biological methods to mitigate the salt toxicity. 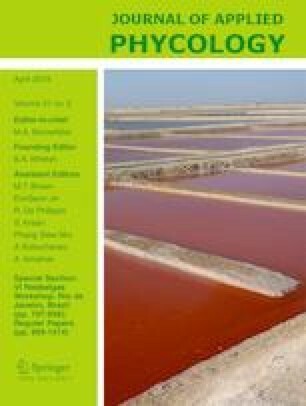 The present study describes proteome dynamics and salt stress tolerance of the salt-primed (pre-exposed to salt) and directly salt-stressed cyanobacterium Anabaena fertilissima. The difference in the proteome of differently salt-treated and the control cells was the abundance of proteins. Out of 130 proteins resolved in control, 51.8% remained constant, 25.5% were upregulated, and 22.7% protein spots were downregulated in salt-adapted cells (exposed to 500 mM NaCl). However, in cells exposed to 250 mM NaCl, percentage of constant, upregulated, and downregulated proteins was 56.8, 16, and 27.2, whereas in the cells exposed to equimolar NaCl+Na2SO4 mixture, these values were 41.8, 29.4, and 28.7, respectively. This indicated that an altered protein expression occurred in large number of protein species under different salt-stress regimes. Four proteins showing significant and reproducible changes under salt stress showed close homology with photosystem I reaction center subunit XII, epoxyqueuosine reductase, response regulator protein VraR, and molybdopterin biosynthesis protein. The kinetic analysis revealed that salt treatment increased the abundance of all the four identified proteins. Despite the exposure to higher NaCl concentration (500 mM), salt-adapted cells showed minimal hyper accumulation of these four proteins, followed by NaCl and NaCl+Na2SO4 mixture. Lesser accumulation of these identified proteins in salt mixture stressed cells than that of NaCl stressed cells revealed that the availability of sulfur during salt-stress relieved the salt-toxicity, while Cl− increased it. The online version of this article ( https://doi.org/10.1007/s10811-018-1607-y) contains supplementary material, which is available to authorized users. Ashwani K Rai gratefully acknowledges the National Academy of Sciences, India, for awarding NASI-Senior Scientist Fellowship.